The exhibition was held in the Rare Books Exhibition space, Sir Louis Matheson Library, Monash University from 11 July - 30 September 2004 Opening address given by Professor Margaret Kartomi, School of Music-Conservatorium. 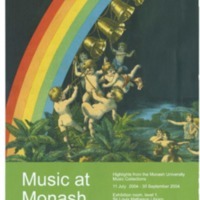 "Music at Monash" is a celebration of the diversity and scope of the Monash University Library music collections and the Monash Music Archives in the School of Music-Conservatorium. The items in the exhibition have been selected expressly to indicate not only the Australian materials in the collections, but also the fascinating ethnomusicological materials in the Archives from many countries, including South East Asia and India.